Why Can’t I Delete Photos Off My iPhone Anymore? After years of being able to manage your photos by connecting your iOS device to your computer, the inclusion of iCloud Photo Library in iOS 8.3 changed things. Post iOS 8.3, you can no longer delete pictures from your device like you used to if you’ve got iCloud Photo Library enabled. Read on as we show you how to get back to managing your files the way you want. In iOS versions leading up to iOS 8.3, it was never a problem to connect your iPhone, iPad, or other iOS device to your computer, and then transfer and then delete photos and movies off the device’s mobile storage much like you would with a flash drive. The introduction of iCloud Photo Library in iOS 8.3 changed the file permissions for all image and movie files in an iCloud-managed directory. After the change, you could no longer delete a photo off your device while it was mounted as a removable device (although you could always delete it using the Photo app on the device itself). This change not only broke the simple act of manually curating your photos from the comfort of your computer, but it also broke any application workflow that relied on importing and then deleting media content. As long as the device is linked to an iCloud account with picture management enabled, you cannot remove files unless you do so on the device. The solution, as you may have guessed, is to disable iCloud picture management on any iOS device you want to manage manually (or use a third-party photo management application). You don’t have to completely disable iCloud (you can continue to use iCloud for your contacts, calendar, and other functions), but you do have to disable all the photo backup and sharing options. We really wish there was a better way to go about this. 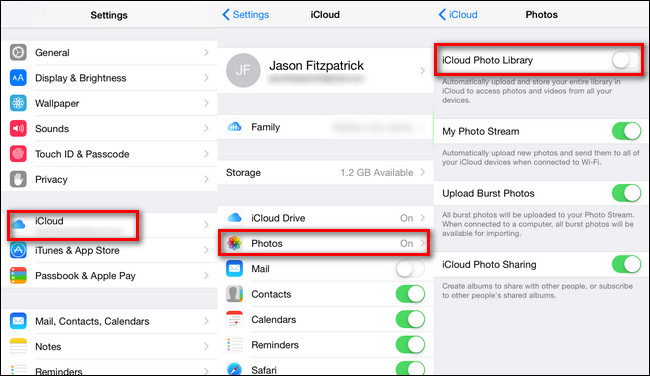 It’s unfortunate that you have to sacrifice the backup and convenient sharing that comes with iCloud photo management, but as of this tutorial there’s no way around the permission system instituted when iCloud photo management is enabled. Once you’ve toggled the above settings, you’re free to connect your device to your computer, and then manually manage your photos. No iOS device restart necessary—the change in permissions takes place immediately after your change the settings. Have a pressing question about your misbehaving device? Shoot us your question at ask@howtogeek.com and we’ll do our best to answer it.